‘Tis the season to be jolly. Hence the Musclebound Thug’s jolly scowl as he rehearses for his part as the jolly fat man, Father Christmas. Total distance for this ride: 57.2 kilometres (35.5 miles). Note: I rotated the mapped image 90º CW for ease of viewing. If you missed them, you can see the Musclebound Thug’s other GPS-doodled escapades here. And here. And here. 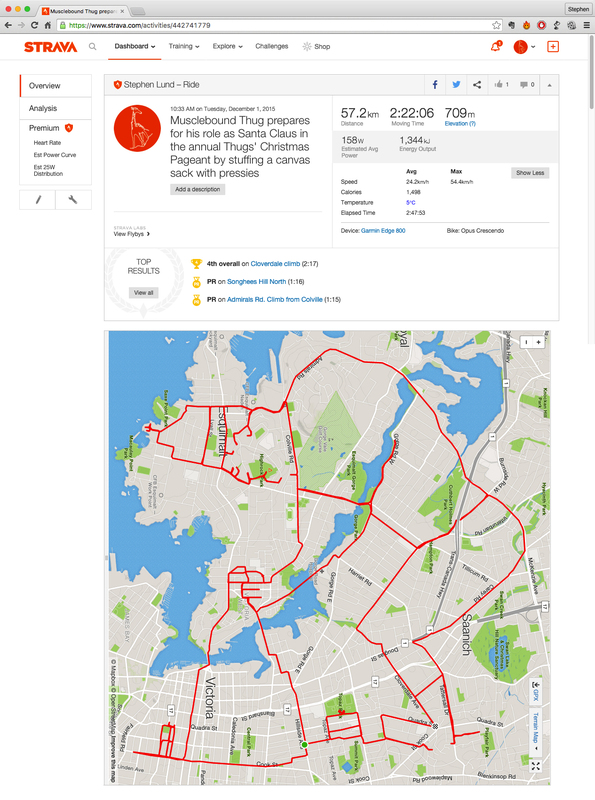 This entry was posted in gps art and tagged bicycling, Christmas, creativity, cycling, garmin, gps, gps art, Santa, Santa Claus, strava, strava art, thug, urban art, victoria bc. Bookmark the permalink.